India beat Australia by seven wickets in the fifth and final ODI and sealed the five-match series 4-1. Coming into this match after winning the Bengaluru ODI, Australia opted to bat and got off to a great start, thanks to David Warner and Aaron Finch's third 100+ partnership in as many matches. Once Warner departed for 53, the Aussies had a mini middle-order collapse as they lost the wickets of Steve Smith and Peter Handscomb in quick succession. Some crucial runs from Travis Head and Marcus Stoinis took them to 242 in their 50 overs. Axar Patel took three wickets for the hosts while Jasprit Bumrah accounted for two. 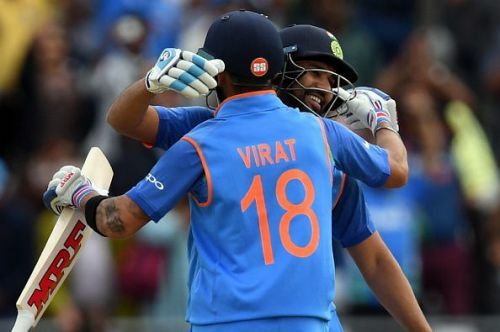 Chasing 243, it was one-way traffic as Rohit's Sharma's 14th ODI century, along with some backing from Ajinkya Rahane and Virat Kohli took India to a win. Let us take a look at the records that tumbled during the match. 1- Rohit Sharma scored his 2000th ODI run today in India, the fastest Indian batsman to do so. He took 42 innings to reach the landmark, overtaking Sourav Ganguly's previous record of 45 innings. 1- For the first time in his ODI career, Kedar Jadhav bowled his full quota of 10 overs. 1- This is the first time that a subcontinent side has beaten Australia in four matches in a bilateral ODI series. 2- Rohit Sharma has hit 54 sixes against Australia, the second most by a batsman against a single opposition. Only Shahid Afridi's 63 sixes against Sri Lanka is higher. 2- Rohit Sharma became the second fastest opener to score 4000 ODI runs. He reached the milestone in 83 innings, four more than Hashim Amla. 3- Rohit Sharma and Ajinkya Rahane become the third Indian pair after Rohit/Shikhar Dhawan and Rahane/Dhawan to have three consecutive century stands in ODIs. 3- Rohit Sharma became the third fastest after Virat Kohli (136) and Sourav Ganguly (147) to score 6000 ODI runs. He took just 162 innings to reach the milestone. 4- Ajinkya Rahane scored his fourth consecutive fifty against Australia. Sachin Tendulkar and Virat Kohli are the other Indian batsmen to have done it before him. 5- The fifth instance of Rohit Sharma scoring more than 50 in three consecutive ODI innings. Three such streaks have come in the last 16 innings. 6- This is Rohit Sharma's sixth ODI century against Australia. Only Sachin Tendulkar, with 9, has more centuries against the Aussies. 8- This was the eighth 100+ opening stand for India in ODIs in 2017, the most by them in a calendar year, overtaking the seven they had in 2002 and 2007. 29- The number of sixes hit by Rohit Sharma in 2017, the most by any batsman. He overtakes Hardik Pandya's tally of 28 sixes. 50- The number of matches lost by Australia in India, the most they have lost overseas. This is the first time since the 2015 series against Bangladesh that Virat Kohli failed to score a century in an ODI bilateral series.